C Robert Sacre, 7-0/247, Soph. F Elias Harris, 6-8/215, Fr. G Matt Bouldin, 6-5/224, Sr.
G Demetri Goodson, 5-11/164, Soph. G Steven Gray, 6-5/208, Jr.
F Bol Kong, 6-6/220, Soph. F Kelly Olynyk, 6-11/215, Fr. G Grant Gibbs, 6-4/204, R-Fr. 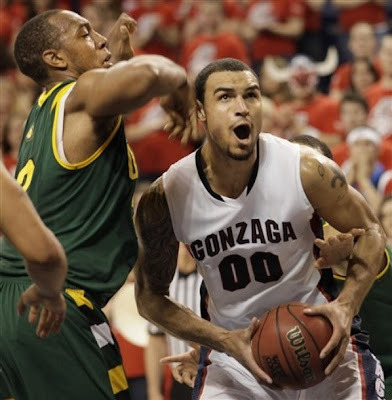 Gonzaga March Madness 2010 profile: Gonzaga is a very young team with senior Matt Bouldin trying to lead this team past the second round. Bouldin can is very good and Elias Harris is a great freshman from Germany but this team is inconsistent. Gonzaga might beat Florida State in the first round but we think they will be in for a fight and we are picking them to loose in our bracket as they won't beat Syracuse anyways. Watch out next year though for Gonzaga as that could be their year with Harris having another year under his belt.